I have been a full-time Student Ministry Pastor for 12 years now, with 4 years working in Student Ministry part-time before that. I love my job…Student Ministry is definitely the passion God has given to me. But it can be hard at times. Not because of all the late night or weekend events, trying to make it to all the students games/activities, driving students around, managing a small budget while dealing with major expectations, planning 2 or 3 lessons a week, etc. Those are all part of the job and I mostly enjoy them. What can make it hard is the view of the Student Ministry Pastor that many have. 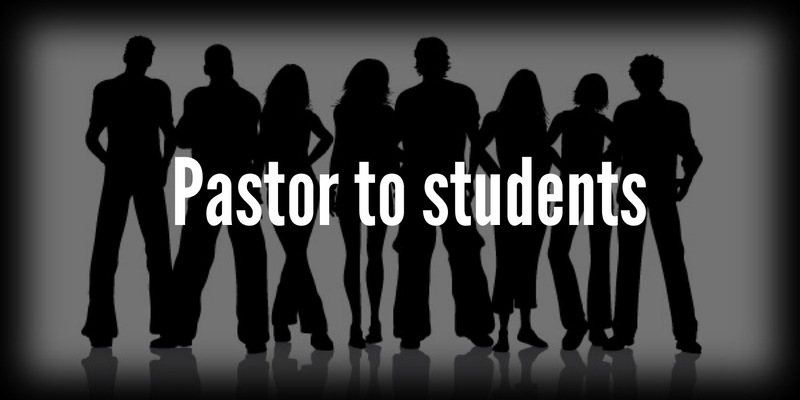 There is a view that the Student Ministry Pastor is a “lesser” pastor than other pastors. Now, I fully understand that I am not the guy in charge of the church and that the Senior Pastor is my boss. I understand that, and I have no problem with it…in fact I like not being the ultimate person in charge all the time. There is a hierarchy that is necessary, and the Student Ministry Pastor is not at the top of that hierarchy. However, that does not make us any less of a pastor. Part of the problem is that this is how many see and view Student Ministry Pastors…but part of the problem is that this is also how many Student Ministry Pastors view themselves and do their job. Many joke about the job, saying that they get paid to play with students or that the reason they are in Student Ministry is because they didn’t want to grow up. I know, because I’ve made some of those jokes before. And while there is nothing wrong with joking, I think many have adopted those ideas to a point and it has begun to affect how they see their job as Student Ministry Pastors. A while back I had someone come up to me after I preached a sermon in the Sunday morning service and tell me that I’m a good speaker, so someday I’ll make a good Senior Pastor. I know they were just giving me a compliment, so I thanked them. But that comment stuck with me, and I continued to think about it a lot the next several days. Not because I wanted to think about their compliment over and over to make myself feel good…but because of the idea expressed within the compliment that since I am a good speaker, I must become a Senior Pastor someday. Don’t students deserve good speakers too? Thinking through that statement really began to challenge my thinking, and change how I viewed myself and what I did as a Student Ministry Pastor. I began to view myself and my job as a Pastor, and the specific flock I shepherd are students. I began to not just see myself as the goofy fun guy who ran the youth group (although I still am that guy too) but rather that I was the Pastor of a ministry that was geared toward and focused on students and helping them fall more in love with God every day…either for the first time, or as they grow in their relationship with God. I began to see myself as the leader of a ministry that is focused on the students of today, who will be the leaders of the church tomorrow. I realized that Ephesians 4:12 was my job…I am to be equipping the saints for the work of ministry, and that the majority of those saints whom I am called to equip happen to be students. I understood that my calling to shepherd students was no less important than any other Pastoral or Leadership role in the church. Students are a vital part of the church today, and thus those who are given charge over them need to take that responsibility seriously, never thinking they are a lesser Pastor or Leader than anyone else in the church. To all of you who are Student Ministry Pastors and Leaders, don’t allow yourself to see what you do as anything less than a Pastoral/Leadership role. Understand the huge responsibility you have to shepherd your flock, which is your youth group. You are a Pastor/Leader to students, and students deserve a good Pastor/Leader same as the adults do. Understand that as Student Ministry Pastors/Leaders, we are leading and training tomorrow’s spiritual leaders, and that is a big deal. So be the Pastor/Leader to your students that they need you to be.